Moms and babies need to be comfortable when breastfeeding. Find a position that works for you. Laid Back: Good way to help your baby use his natural instincts. Cross Cradle: Good position for smaller babies. Clutch or Football Hold: Good for women with large breasts. 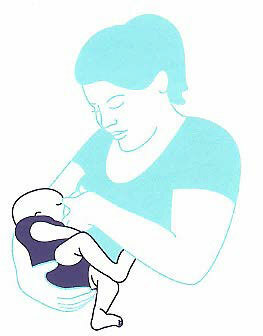 Lying Down/Side-Lying Hold: Most comfortable for women who have had a difficult delivery or for night feeds. Cradle Hold: Most common position for older babies.